Bring your adventurous spirit and feel the rush as you take the plunge on a precipitous mountain bike tack, climb a cliff, conquer a summit or abseil down a rocky escarpment. Morialta Conservation Park in Woodforde, just a 25-minute drive from Adelaide, is a great place to get your adrenaline pumping. In addition to a host of walking trails to suit everyone from the casual ambler to the experienced hiker, the park's dramatic landscape makes for excellent rock climbing opportunities. Venture Corporate Recharge offers a range of programs for rock climbing and abseiling with professional qualified staff and quality equipment. 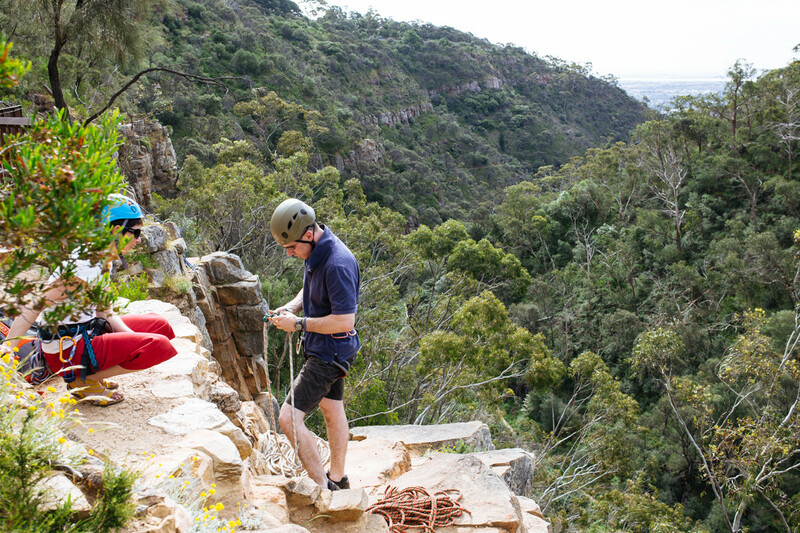 Catering for schools, corporate and sporting groups and run set dates for individuals, Venture Corporate Recharge's most popular sites include Morialta Conservation Park and Onkaparinga Gorge. Rock Solid Adventure leads small groups in rock climbing in abseiling activities in the park including options for beginners. Scenic highlights of the park include seasonal waterfalls, fern gullies, stringybark forests, creeks, gorges and ridges. JAKEM Farm at St Ives (45 minutes south-east of Adelaide) offers four-wheel-drive tracks over 700 acres of undulating hills. Get back to nature looking for kangaroos, wedge tailed eagles, ducks and turtles along the Mount Barker Creek. Visitors are welcome to stay for the day or camp under the stars. The property features play equipment and dogs are allowed. Saunders Gorge Sanctuary, on the eastern slopes of the Mount Lofty Ranges about 75 kilometres from Adelaide, is home to the Eagle View 4WD track. This private conservation area adjoins three regions - Adelaide Hills, Barossa and Murraylands - and offers spectacular and rugged beauty which can be enjoyed on the Eagle View self-drive track. The track is made up of rough scenic tracks with optional rougher sections for more adventurous drivers. Saunders Gorge also offers bush camping, B&B accommodation and dining. The Adelaide Hills is ... well, 'hilly'. This makes for some pretty amazing mountain bike riding whether it's at Eagle Park Mountain Bike Park or on the Mawson Trail.The region has hosted range of national and local mountain bike, cross country, downhill and endurance races, and has developed a reputation as having some of the best trails in Australia. For more information see Cycling and Mountain Biking in the Adelaide Hills. Horse enthusiasts will tell you there is no better way to see the Adelaide Hills than on horseback. There are a number of excellent trails suitable for horses criss-crossing the region and guided horse trail rides are another way to have a horse adventure in the region. For more information see Horse Riding and Activities. The Woodhouse Activity Centre at Piccadilly is run by Scouts Australia and provides a range of adventurous activities and accommodation, including camping. The obstacle course on Challenge Hill is a major fun feature of Woodhouse, and one of the best of its kind in Australia. It does demand a level of fitness, but if tackled with care and consideration, will provide fun for all the family. Challenge Hill is regularly used by school groups, sporting clubs, corporate and government groups and the armed services. It is a great test of physical fitness and mental agility and is perfect as team-building exercise. Mt Lofty Adventure Hub, located at Woodhouse Activity Centre in Piccadilly, features South Australia’s original and biggest challenge ropes course, along with the amazing Adventure Tower, with a 15 metre climbing face, two abseil walls plus South Australia’s longest flying fox at over 320 metres long. It also has the mighty mega swing - an 18 metre high three-person rope swing which is the biggest rope swing in SA! Southern Adventure Hub, located in the picturesque Douglas Scrub sanctuary in Blewitt Springs, has South Australia’s first continuous challenge ropes course along with more traditional belayed elements, including a face to face leap of faith. It also has a three faced climbing tower, with lots of options for climbers of all abilities.